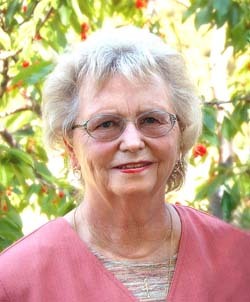 Frances L. Prock of Berthoud, died October 26, 2010 at Northern Colorado Acute/Long Term Hospital, Johnstown. She was 73. Fran was born on October 5, 1937 in Great Falls, Montana to Otto Sagebaum and Lillian Laiture Sagebaum. Raised on the family ranch near Stockett, Montana, she was introduced to hard work at an early age. She attended a one room schoolhouse in her young years, graduating from Belt High School where she participated in the band and was on the school newspaper staff. Fran would then enter Great Falls College, receiving her teaching degree. Fran was a wife, mother and community volunteer. She was involved in starting the Helping Hand in Longmont in the early 1960’s. In addition, she assisted Tiny Tim Center, was a Pink Lady at the Longmont United Hospital and volunteered at both the Longmont and Berthoud Library’s. She secured her real estate license and was associated with Mitchell Real Estate. Fran was a faithful member of the First Presbyterian Church of Berthoud. She was a member of the Bible Study Fellowship, Longmont, serving as their leader for a term. She was also a member of the Longmont Quilters Guild. Camping was a frequent adventure for the Prock family. In later years, she and John enjoyed traveling whenever possible. They spent many miles on the road in their RV, including an especially memorable road trip to Alaska. They also enjoyed an extended trip to Germany seeing part of her heritage and beautiful sights the country and area offered. Surviving are her husband of Berthoud; two daughters Alice (George) Sittner of Longmont and Sandra (Dave) Pechin of Platteville; a son Eugene (Brenda) Prock of Berthoud; grandchildren Lea Ann (Chris) Byrne, Aaron Sittner, Joshua Prock and Riley Pechin; a brother Fred Sagebaum of Butte, Montana; and a sister Deanna (Alan) Siggins of Cody, Wyoming. A cremation has been entrusted to the Howe Mortuary and Crematory. Services will be held at 10:30 a. m., Monday, November 1, 2010 at the First Presbyterian Church of Berthoud with Reverend Scott Phillips officiating. Contributions may be made to the First Presbyterian Church, P.O. Box 1290, Berthoud, CO 80513 or The Colorado Lupus Foundation, 1211 S. Parker Road, #103, Denver, CO 80231.